Ultra light comfort and Maximum Support come together for a great addition to your workout. Double Dry technology wicks sweat and dries quickly for cooler comfort. Sleek molded inner lining for support and no show-through. Seamed outer cup helps shape. 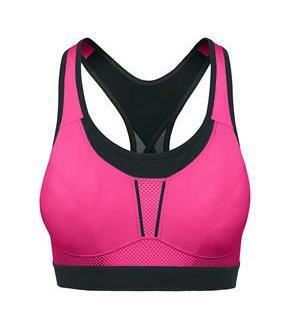 Extra strength power mesh back with cut-out provides maximum ventilation. Mesh neckline and sides keep the air flowing. Padded hook and eye close with back multi-adjuster helps you customize your fit.